Houses & Homes VA: I Want This NOW! Do you know the biggest drawback to all of our fancy phones today? It is the screen size! Yes, we can watch the latest YouTube videos or even our favorite TV series at any given moment but only on a 2 ½ inch screen. We couldn’t even think of showing a presentation to a client in this way but what if we could use our phone to display a much larger image to view? Well, the day is coming soon (or is it?) that your handheld phone will be able to display an image as large as a 50 inch flat screen with the push of a button! That would almost entirely negate the use of notebooks and laptops for many people and the convenience of carrying a “mini theatre” in your pocket (or purse) would be unheralded. 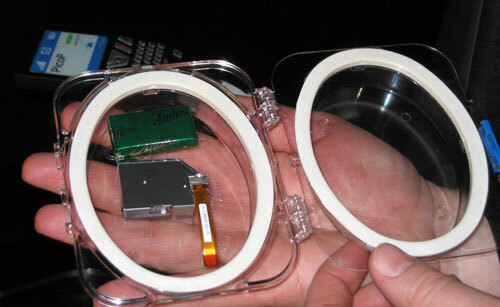 Microvision has invented a tiny projector that is no larger than an Andes thin mint and can easily be fit inside of just about any mobile phone on the market today. It can display a picture as large as a 50” monitor with reasonable clarity provided that the room is sufficiently darkened. High def. is not yet available but the resolution is 800 x 600 (SVGA) and that’s good enough to enjoy a movie or make a professional presentation to colleagues or clients. The secret is the use of lasers instead of a projection bulb as is used in larger projectors today. This makes it possible for the projector to be unimaginably small. The problem is that Microvision introduced this tiny miracle way back in 2007 and I have yet to see it in use, have you? I can’t imagine why such an incredibly useful device isn’t being marketed everywhere and by now it should be in every laptop, computer, cell phone and PDA on the market. I hope that this does become available soon because carrying around a “presentation in your pocket” would be awesome!